Lacerations. Broken glass, flying debris, and facial impacts can all result in severe cuts, bruises, and deep gashes in the skin. Although these cuts may not be fatal, they could be life-altering by causing significant facial scarring. Broken nose. A fractured nose is one of the most common facial injuries sustained in a car accident. Your nose is the furthest protruding feature on your face and, as a result, when your head is being thrown around a confined space, such as the cab of a car, your nose is vulnerable to impact. Dislocated jaw. Frontal airbags and dashboards play a significant role in facial injuries. Depending on the angle of your head during a collision, the force of an airbag inflating can essentially punch you in the jaw. Since the purpose of the airbag is to prevent you from hitting the dashboard, the acceleration rate of the bag’s deployment is extremely high, and can easily dislocate your jaw, loosen teeth, and break bones. Orbital fractures. The impact force of your face hitting the dashboard, an airbag, or other debris can cause the delicate bones surrounding your eye socket to crack or shatter. An orbital fracture is especially dangerous, as pieces of chipped bone can lodge themselves in the eye itself, creating lacerations and opening the eye up for infection. An unfortunate truth about facial injuries is that the majority of wounds will leave a permanent reminder of the incident. Lacerations will most likely leave scars. 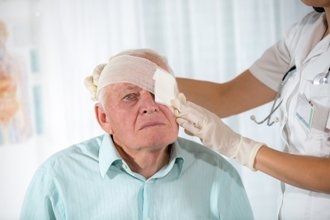 Broken noses and jaws have the potential to cause severe swelling which can inhibit the proper mending of the bones, while orbital fractures can cause permanent vision problems. Although these effects aren’t necessarily life-threatening, they can create severe psychological problems that can ultimately disrupt a victim’s quality of life. For many victims, facial trauma sustained in a car accident isn’t easy to get over. It can stay with them for the rest of their lives. Therefore, you should never allow anyone, whether it be a family member, friend, or even an insurance adjuster, to downplay your injuries or tell you that they aren’t serious. You are the only person who can know the depth of your injuries and what they mean. For more information on car accident injuries, please feel free to browse our library of informative articles. We take pride in providing our clients with the resources and knowledge they need to better understand their risks, their rights, and their options. Take advantage of our findings and research today. Post a Comment to "Effects of Facial Injuries on Collision Victims"